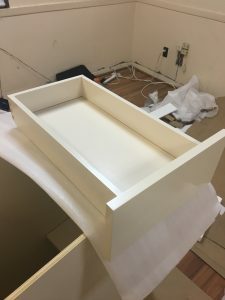 Today we take a look at the Vanilla Shaker cabinet from RTAcabinetstore.com and examine the positive and negative qualities we believe stand out to present you with a summarized review of this particular Shaker model design. I placed the order 5 days before it arrived to me, so the shipping time advertised on RTAcabinetstore.com of 5 to 7 business days holds true. 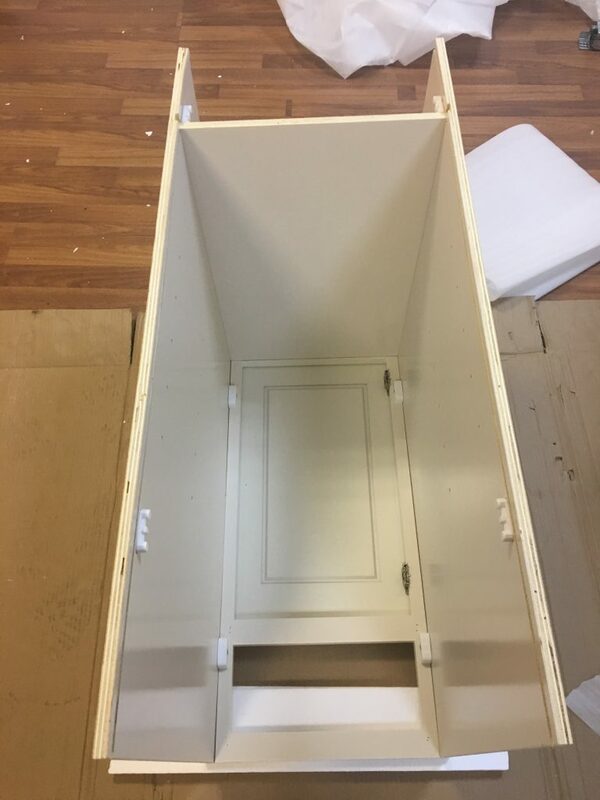 The first thing to be noted about this Vanilla Shaker cabinet is that the door is shipped pre-attached, which decreases the risk of scratching the smooth finish of the paint during home assembly. Also to be noted is the Steppe-design on the otherwise traditional 5 piece birch cabinet Shaker door (seen in Picture 1 below), with which some Shaker purists may find issue but I find to be a decorative issue not affecting the function of the door itself. Overall, the door and frame are well-made from a dependable hardwood, leading me to trust the build of the two to remain durable over extensive use in time. The finish/paint is noticeably off-white, indicated by the “Vanilla” in the name of the cabinet (Picture 2). 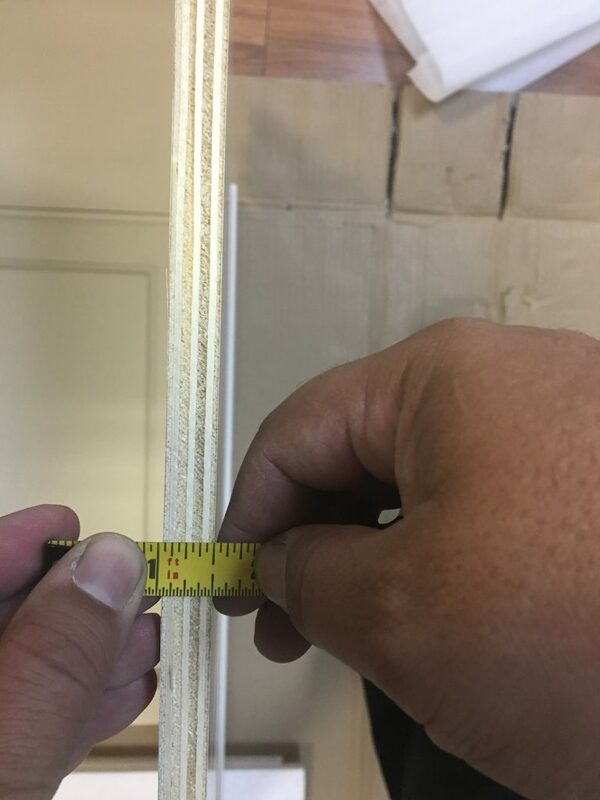 There are no cracks or damage on the frame, door, or drawer face. There is, however, visible wood grain on inside middle panel. This is only noticeable at certain angles but could be an issue to an individual looking for a flawless paint/finish. The off-white is admittedly not the most popular finish from RTA Cabinet Store, but I believe it has a more calming tone than the sharp white finish found on other models. While I like the clean look of a pure white finish, the Vanilla finish has it’s own unique appeal. 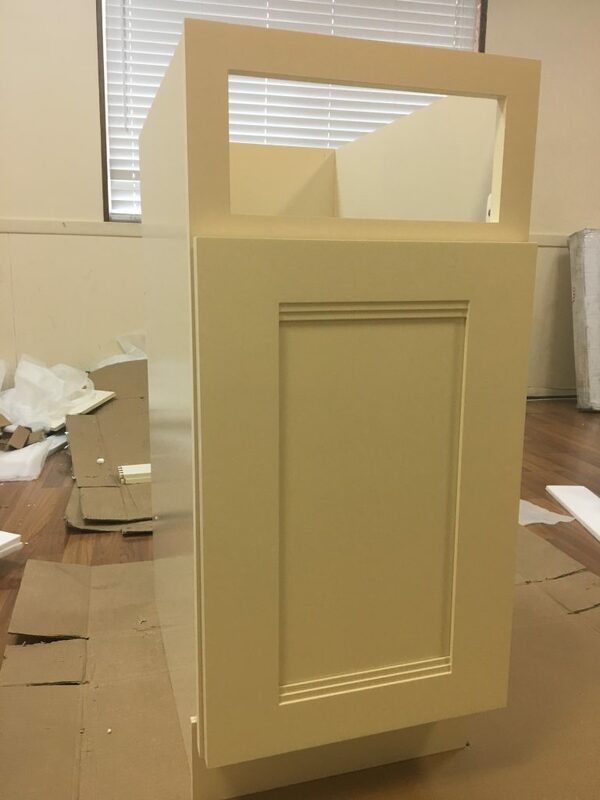 As I am grading on quality of the finish rather than hue of the paint, the Vanilla color will not count against this cabinet’s grade in this particular category. 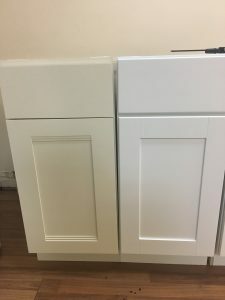 This cabinet is unique in that it has a matching interior paint job to the exterior of the unit. This approach appeals to many people as the continuity of painting the interior and exterior has aesthetic value. 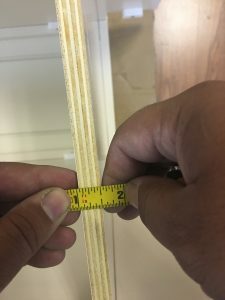 I am impartial to both matching and non-matching interior, as the quality of the cabinet itself is not affected by whether or not the interior of the box is painted. That being said, the consistency of the paint job on and in the Vanilla Shaker has an undeniable charm. The thickness of the paint is evenly applied and the finish has a sharp sheen. Again, if you are in the market for a pure white Shaker style cabinet then the Vanilla Shaker may not be the option for you. The quality, however, cannot be overlooked. With its picture frame back panel and ½ inch thickness on the side/bottom panels (Pictures 4 and 6) as well as the toe kick, the Vanilla Shaker’s plywood cabinet box is just slightly thinner than other Shaker models. 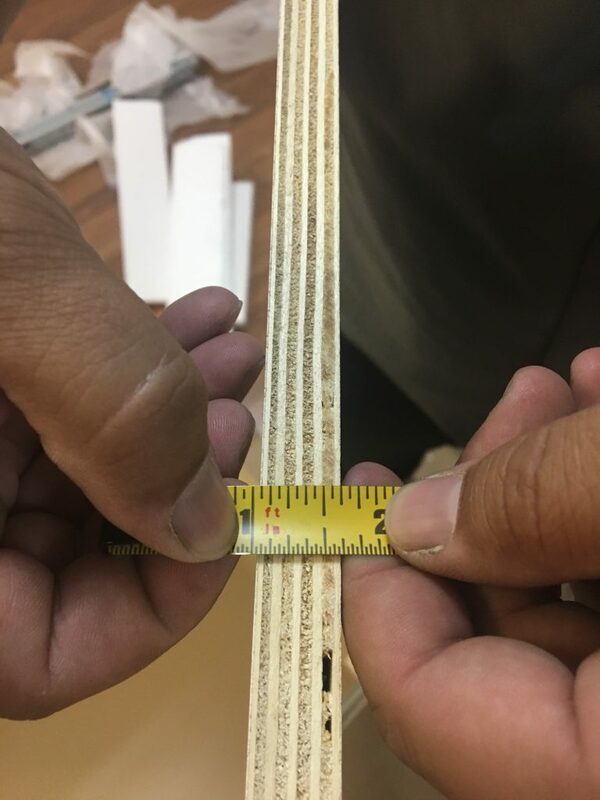 The quality of the plywood, however, has little to no discrepancies and feels strikingly dependable. 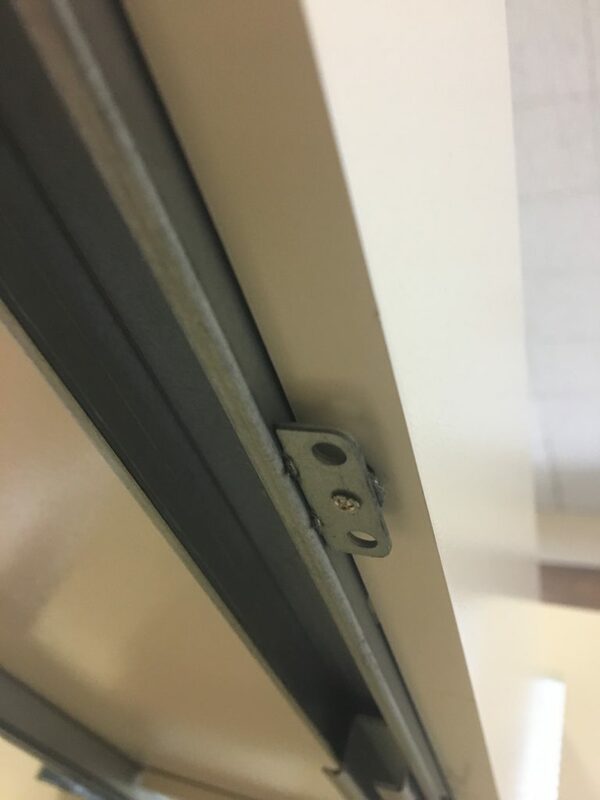 It is held together with thin plastic cam locks combined with tongue and groove joints as well as plastic corner brackets. 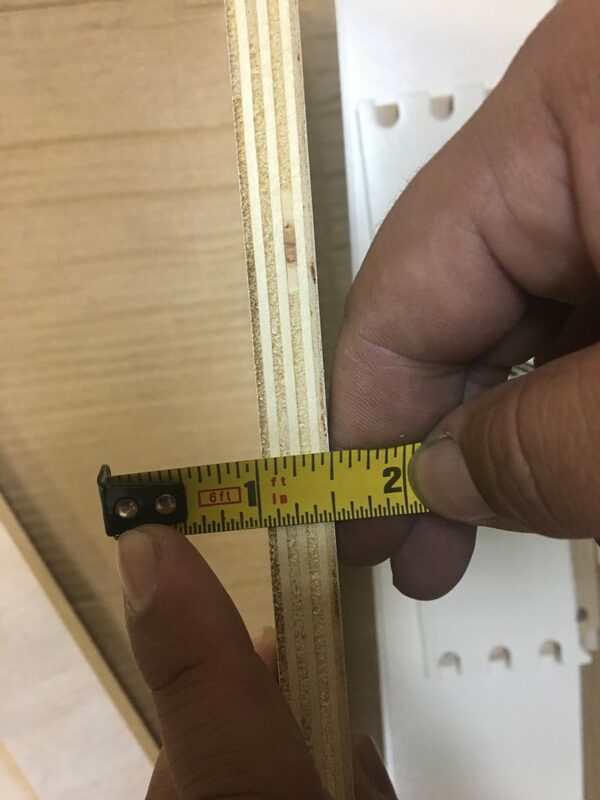 While the cabinet feels sturdy, the quality of the hardware used to hold it together could be stronger. 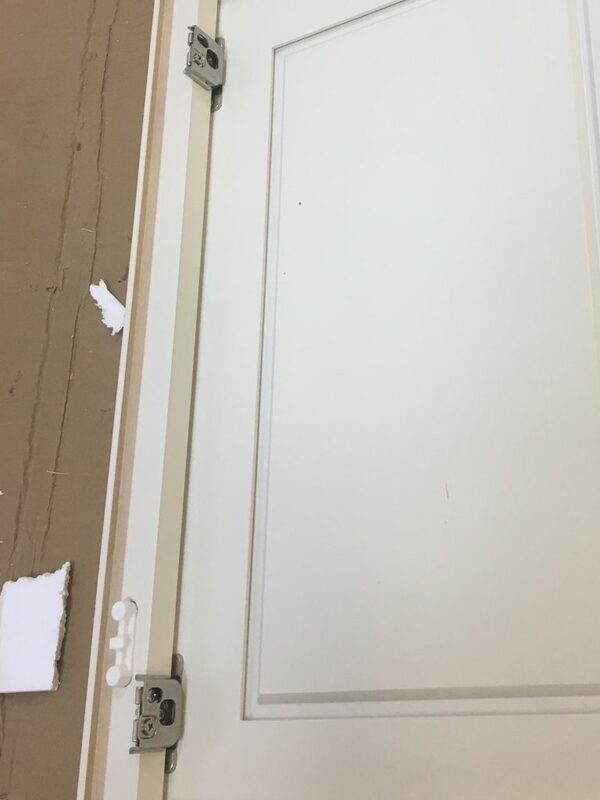 *One of the side panels arrived with some slight damage on the bottom rear corner outside the groove where the back panel fits in (Picture 5, below-middle), but this did not affect the sturdiness of the cabinet itself and was purely cosmetic. The drawer box for the Vanilla Shaker consists of ½ inch thick panels on the sides as well as the bottom board (Picture 7). The box is fastened together at the joints with solid, tight four-toothed dovetails to make for a structurally sound drawer (Picture 8). Most noticeable about the drawer box is the fact that it is painted the same Vanilla stain as the rest of the box (Picture 9). This attention to detail undeniably speaks to the quality of this unit and ends up providing the most aesthetically consistent unit assembled to date on this review site. Also to be noted is that the drawer fully extends to utilize maximum storage. The interior shelf in the Vanilla Shaker is 12 inches in depth, 5/8 inch thick (Picture 10) and constructed from quality plywood. 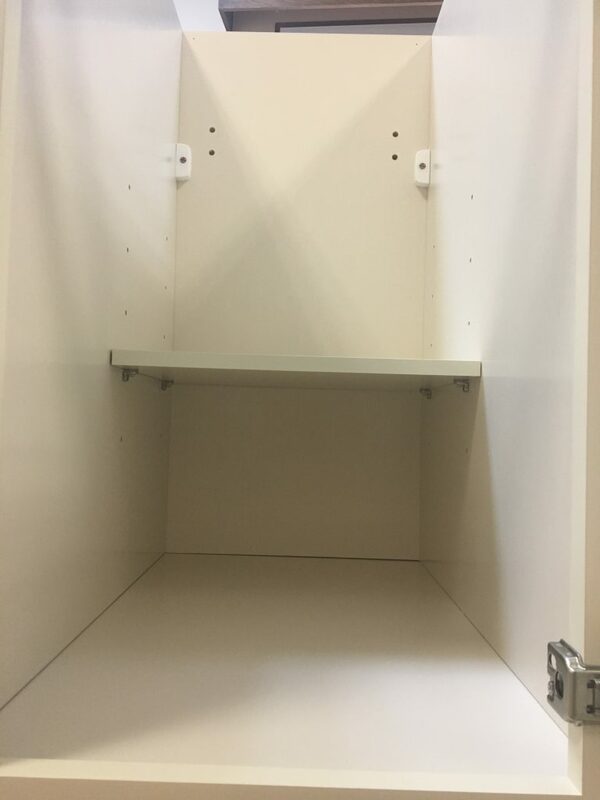 This half shelf is standard in these units but ultimately take away from valuable storage space in order to cut manufacturing costs. Stained and finished on three sides, the adjustable shelf is capable of being flipped over in the event one side becomes dirty or scratched (Picture 11). As previously noted, the drawer is full extension to maximize available storage space. 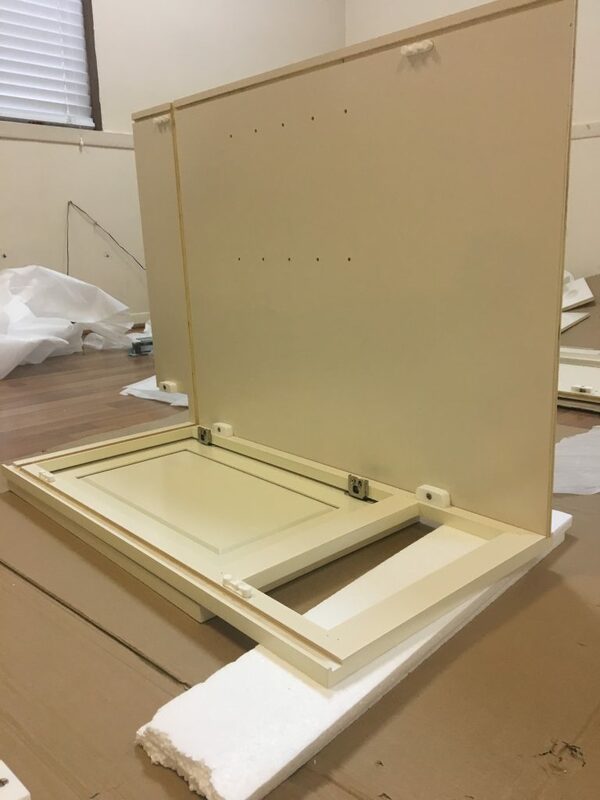 The hinges attaching the door to the cabinet frame are quality soft close mechanisms (SCM) and come pre-fastened to the unit when it is shipped out 9 (Picture 12, below). These SM’s are quickly becoming industry standard, so it is worth noting when one comes across the workbench without them. 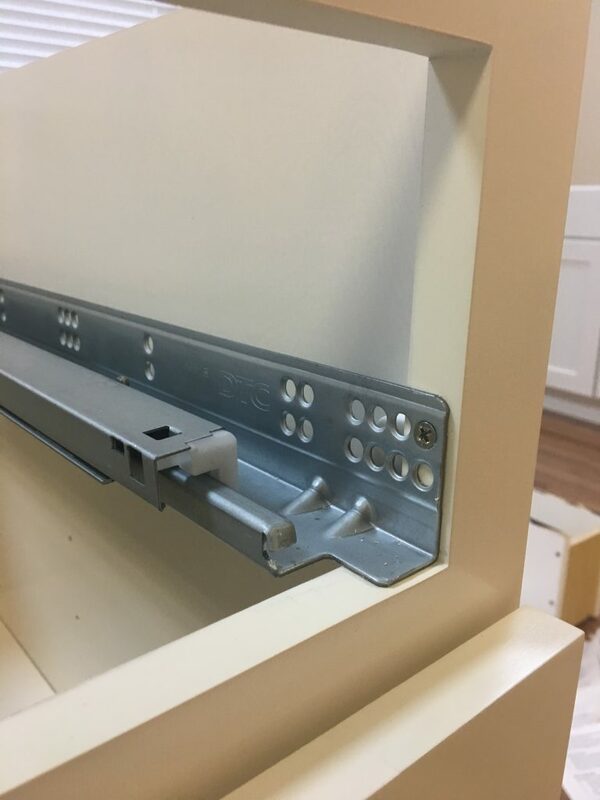 Shipping the frame and door pre-attached also saves the builder the challenge of accurately aligning the door with the drawer face to create the uniform, full-overlay look desired when installing multiple units in a kitchen. The Vanilla Shaker cabinet uses under mount tracks for its drawer slides. 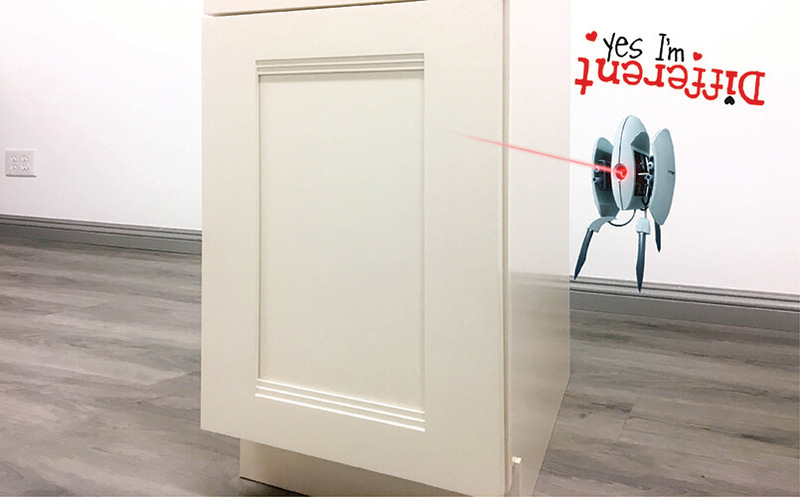 The metal tracks attach to the back panel of the cabinet using a pair of strong gray plastic brackets (Picture 13—below, left). These strong plastic anchors are worth noting because they are the most secure ones I have installed in a cabinet yet. The fronts of the drawer slides are then fixed to the frame with small wood screws (Picture 14—below, center). 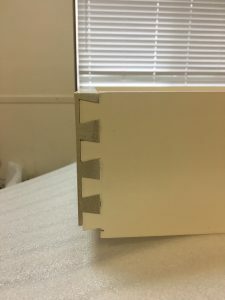 The drawer tracks have small metal pegs that fit into corresponding holes in the underside of the drawer side panels (Picture 15—below, right). Each of these steps is significant in ensuring the drawer box remains attached firmly and for many years to come to the tracks glides. These glides come pre-oiled and retain soft-close mechanisms. This cabinet is assembled with tongue and groove joints and held together with cam locks (Picture 16–below, left). The “lock” on the cam lock is a plastic box that sticks out off the side of the panels. 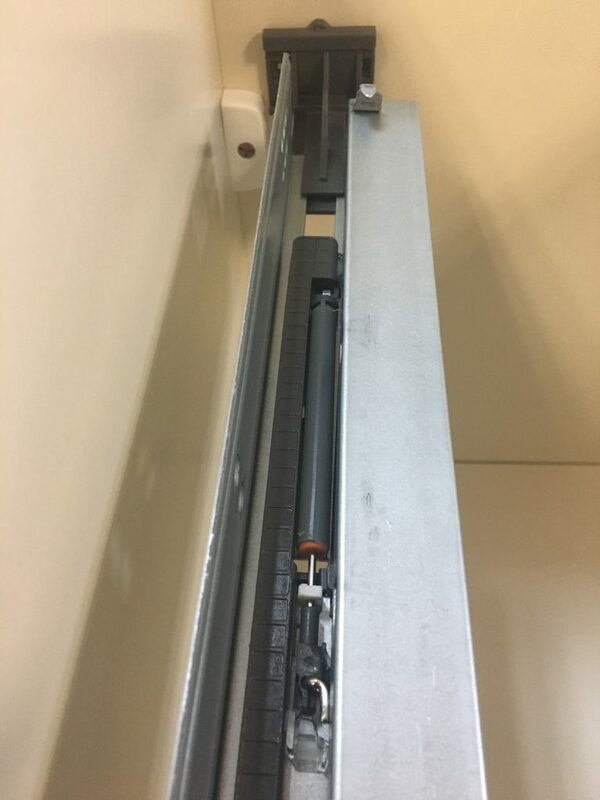 The other panel has a set of short plastic posts that protrude from the cabinet frame and fit into the cam lock (Picture 17–below, right). It feels less strong than other metal cam locks I have used but it was extremely easy to attach the side panels to the frame. 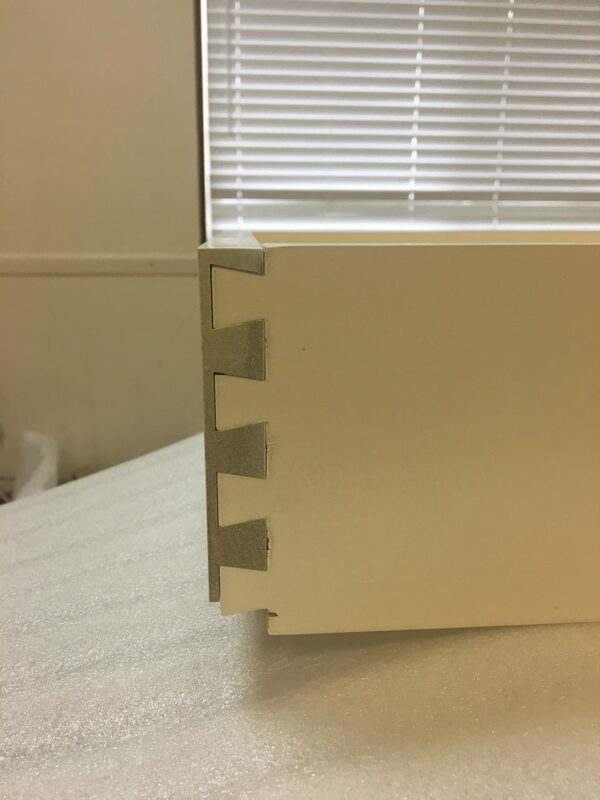 The Vanilla Shaker cabinet has hard plastic corner braces (Picture 18, right). These do not seem quite as strong as solid wood corner braces. 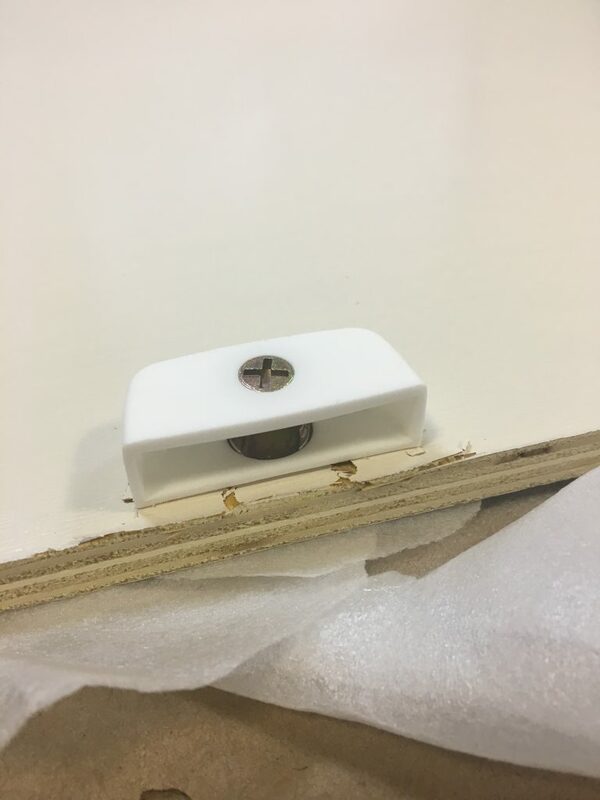 I would highly suggest setting your power drill to its lowest setting or hand tightening the screws into the plastic corner braces, as they could easily be drilled through and damaged. 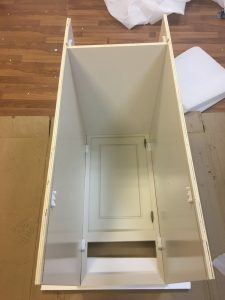 Unfortunately for the Vanilla Shaker, the hardware connecting all the different parts of the cabinet feel very weak and liable to break after minimal usage. Were the hardware a bit more dependable, this would likely have been the highest quality unit I have built and reviewed insofar. The unit arrived in a single package composed of double-corrugated cardboard. 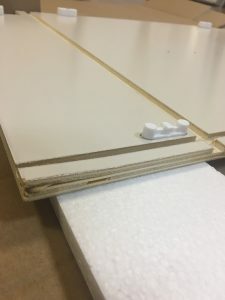 Styrofoam blocks and sheets keep the individual pieces separated and relatively well-protected (note above the picture of the side panel with some minor cosmetic damage) in addition to corner protectors both in and outside of the package for added stability (Pictures 19, 20–below, left and center). The hardware is organized into separate plastic bags and drawer track slides protected in their own small package (Picture 22–below, second row, left). Not included, however, were any instructions for assembly. This is unfortunate, as the packaging category of the scoring system specifically calls attention to the manner in which instructions are protected in the shipped unit (or if they are included at all). No instructions can make assembly a frustrating process, especially if you intend to build the unit yourself. A list of hardware and a step-by-step guide will inform the builder what tools are necessary and expedite the assembly process. Although there are no instructions, the Vanilla Shaker is an extremely easy build with its plastic cam lock mechanisms, minimal hardware, and pre-attached door. 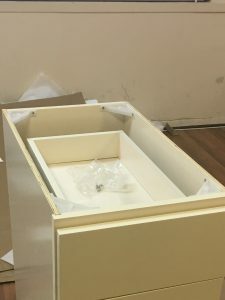 The only tools required for building this cabinet are a power drill (with a Phillips bit), Phillips hand driver, a rubber mallet, and a knife to open the packaging. With a messaging system available to use through their website, I left a message with RTAcabinetstore.com asking questions concerning the style of the Vanilla Shaker. They responded pretty quickly, within the same business day, and answered my inquiries succinctly. Their website advertises a phone number at the top of the page, which I called but was ultimately led to a machine requesting me to leave a message. Although no issues were pressing with the Vanilla Shaker, it still would have been nice to be led to a customer service representative to answer my questions. The reviews for RTAcabinetstore.com concerning Better Business Bureau are mostly positive, but there are enough official complaints filed on the website to bring attention to experiences customers have had with the company. Many of these issues are the same ones I experienced when dealing with their customer support, mainly regarding the response time from their team in offering solutions to replacing damaged parts. That being said, there are still several reviews with people expressing how accommodating the customer support has been so the experience I have had may not be the norm. The negative reviews on TrustPilot address the extensive response time (or complete lack of response) when individuals attempt to reach out to RTAcabinetstore.com, a problem which I, myself, have run into. The positive reviews focus on the wide variety offered by this vendor, the affordable pricing, and the easy installation. All three of these are true, but my focus is on finding the best quality RTA cabinet without counting price as a part of the criteria, as many low-quality units can be high-priced and sometimes the lowest priced cabinets end up being the highest quality. What this unit offers is an aesthetically consistent with a sturdy build despite the seemingly feeble hardware connecting quality plywood to solid birch cabinet façade. 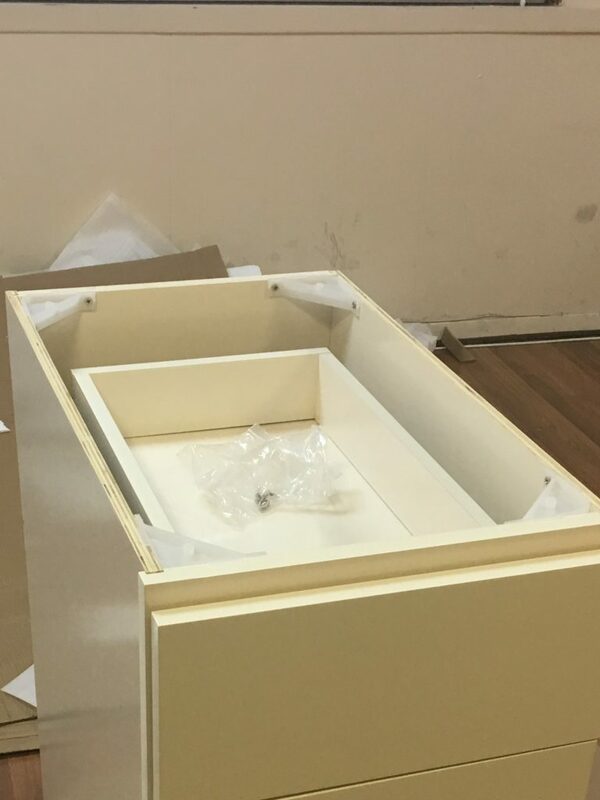 The attention to detail, such as the painted interior of the drawer box and a drawer bottom thicker than average, shows a concentration from the manufacturer on the appearance of the cabinet rather than the quality of the connecting parts or a shelf in the box that extends fully to the frame. With its simple yet different Steppe-design on the door and Vanilla hue stain, this cabinet is suggested for someone seeking to an interior-matching unit with a reliable build.